The Focusing Stage is designed for use with the Focusing Rail (or the identical rail removed from the Auto Bellows), and cannot be used without it. The ¼ inch tripod screw allows an Olympus OM body to be attached, and the rubber top pad helps to stop the body from rotating. The combination of the Focusing Stage and the Focusing Rail positions the optical axis of a Zuiko macro lens on an OM body in line with the centre of a stage plate when they are attached to the Macrophoto Stand VST-1. The larger of the 2 black knobs moves the Stage along the Rail using a rack-and-pinion drive. 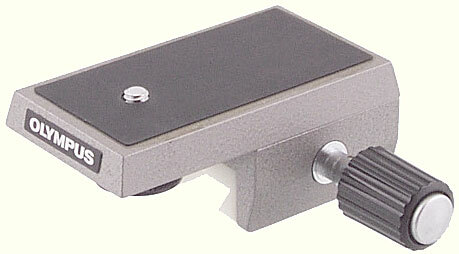 The smaller knob is used to adjust the tension of the drive, or to lock the Stage in place. One of the round caps at each end of the Rail needs to be removed in order to mount or dismount the Stage. Only one version is known. 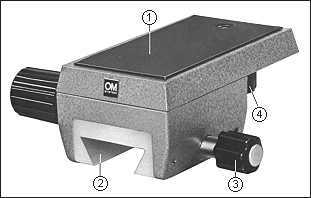 The focusing stage is used for mounting the OM-1 SLR Camera on the focusing rail. This convenient accessory makes it easier to shift the camera along the rail in close-up photography or copying. If you already have the OM-System Auto Bellows, its rail can be used as a focusing rail for this stage. This stage has a built-in camera clamping screw and a camera shift knob. The camera clamping screw fits into a tripod socket at the base of the camera. By turning the camera shift knob you can change the camera position for faster and smoother focusing and composition adjustment.